Thanksgiving and Football at the North Pole - A Silly Clumsy Story! Yes, one year our Thanksgiving was a little “special”. I was flying with the reindeer. We were picking up all the Christmas elves to bring them home. Meanwhile, everyone else at the North Pole was getting ready. Mrs. Claus was making a great big yummy Thanksgiving dinner. She had many elves helping her. Even Clumsy the Elf was helping her. That is to say, he was trying to help. Mrs. Claus asked Clumsy to get a big bag of flour. Clumsy came back with the flour. But Clumsy slipped in a puddle. There was flour everywhere! There was flour on Mrs. Claus. There was flour on the elves. And of course, there was flour on Clumsy! Clumsy got a big stool to stand on. He opened the oven door. He tried to pull the turkey out. But it was a big turkey! It got stuck. It got really stuck! He pulled. Then he pulled harder. He got on his tippy toes and pulled even harder! Then, he pulled as hard as he could! Clumsy fell to the floor. Then Clumsy looked up. He looked way up. Just then the turkey fell right on top of Clumsy! The turkey was stuck on Clumsy’s head! Poor Clumsy could not get the turkey off his head. He tried pulling. Then he tried pushing. But it would not come off. So, he went outside to get help. “Quick, get that turkey!”, I said. Instantly, the elves lined up on one side. Then the reindeer lined up on the other. Someone blew a whistle. Then everyone started chasing the running turkey! He ran 10 yards. Then he ran 20 yards! He ran left. Then he ran right! 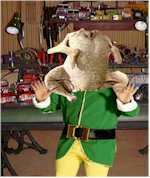 Finally, an elf tackled the turkey! That is when the turkey popped off Clumsy’s head. Clumsy was all right and not hurt at all. He was so happy, he kicked the turkey right through some candy cane goal posts! Now, isn’t that a funny story about Thanksgiving and Football at the North Pole? P.S. Did you like the story about Thanksgiving and Football at the North Pole? Do you think it would be fun to chase an elf with a turkey on his head? You can leave a message for me to tell me. Or, scroll down to see what others have written! That was a silly story heard of football at the North Pole that was funny when Clumsy was wearing the turkey. Santa your an inspiration to me theirs 16 more days till Christmas!!!!!!!!!!!!!!!!!!!!!!!!!!!!!!!!!!!!!!!!!!!!!!! !PS.I want a LOL surprise. That was a funny story. Was any cranberry sauce involved? Tall. Santa. Tree. Fram. Stacy. Pit. Up. Tree last. Night. Paul. Annttee. Pat. Josh. Saw. Santa. Tree. Fram. Stacy. Hi Santa, sounds like it was a bit of a crazy day! Thanks for last years presents! Hope you have a great Christmas. That was a funny story! What did you eat instead of the turkey? How did that Turkey get on his head??? Hello Santa Claus i want to get a lot of presents from you on Christmas.And i had lot of turkey yesterday. Hello Santa Clause I Would Like To Know Was Clumsy The Elf That Clumsy As A Baby And Were Do You Find Your Elves At?? Thanks For Reading MERRY EARLY CHRISTMAS!!!! Previous PostPrevious Merry Christmas, 2017!